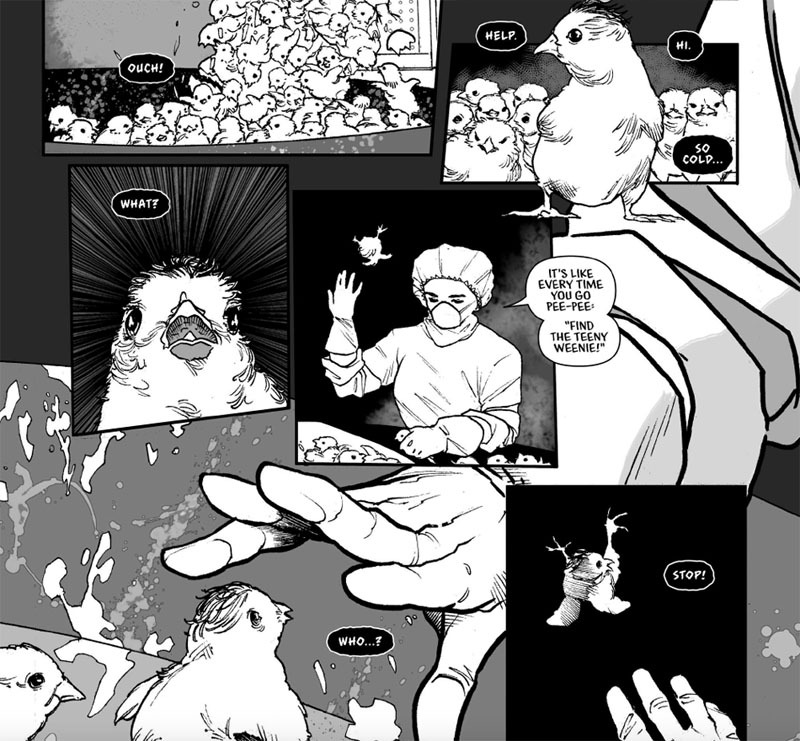 MURDER is an intriguing new graphic novel series that will have you thinking twice about animals. It is written by the team of husband and wife, Matthew & Brittany Loisel. Art by Emiliano Correa. Lettering by Micah Myers. In all respects, this is quite a compelling work in comics. I have to admit that when I first took a look at it, my mind quickly went to the classic song, “Meat is Murder,” by The Smiths. I’m sure that the Loisels knew they would need to bring their A-game to a subject vulnerable to earnest polemics. 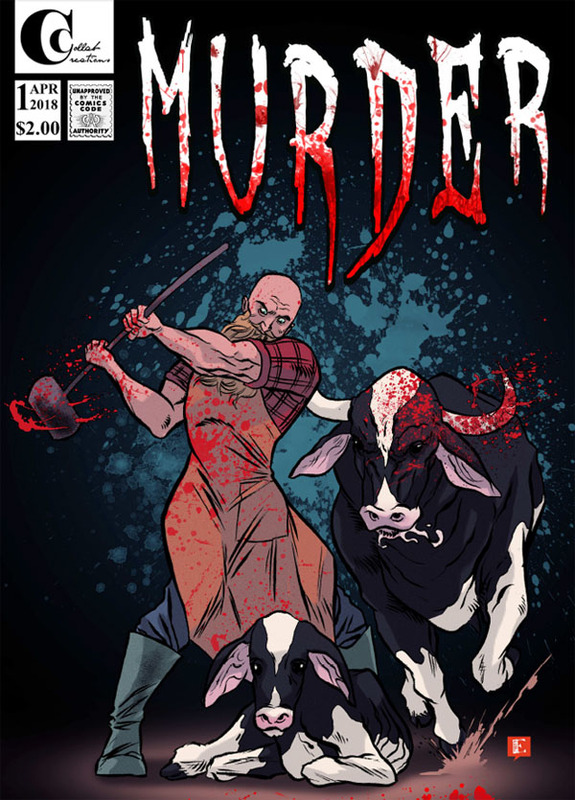 So, yeah, the animals rebel and the meat industry is put on notice but it is all done with quirky style. Meat industry put on notice! One issue in and I am left curious for more. The narrative has a nice natural pace. We don’t know too much about our emerging cast of characters–just enough to be lured in. I’m intrigued by the one standout human in the bunch. We see him in a two-year flash forward going by the name of The Butcher of Butchers. He makes for a colorful vigilante. We start off by seeing him befriend a little baby chick. Chicks and humans don’t mix so well. The little baby chick, by the way, can talk–and the do-gooder human buddy of his understands and casually chats with the chick. Who knew. Humans and animals, just like Doctor Dolittle, can talk to the animals! Well, in this story, it’s only this one human who can parlay with the pachyderms, if he were so inclined. For this guy, chatting with a chick is plenty for starters. Start to think about it, and there are all sorts of critters talking to each other, and the occasional human, in books, movies, and comics. “Animal Farm” and “Watership Down” are a couple of my favorites. 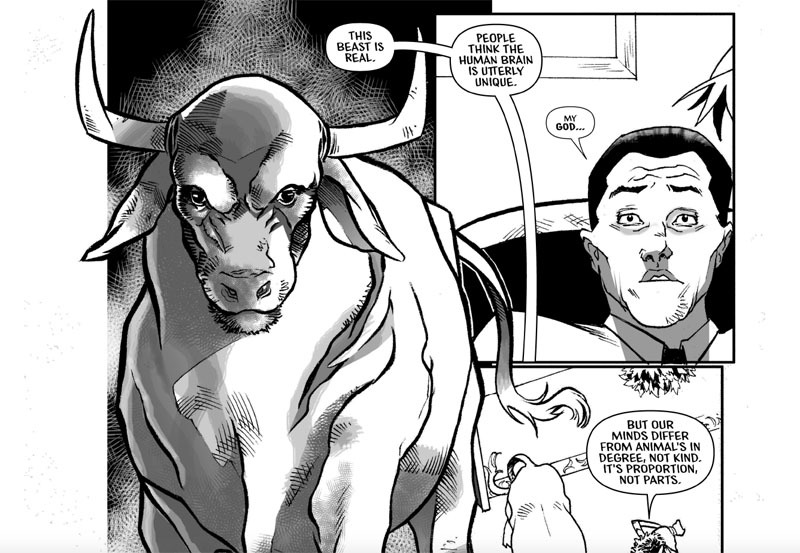 This comic gets a thumbs, paws and hooves up for willing to go out on a limb with a story involving a dog and a cat plotting their overthrow of humans while playing chess. Fionn, glad to get this response from you. I am very impressed with your work! That’s great! I look forward to it.